The first area where we will observe the fine lines and wrinkles is around the eyes areas; therefore it's important to use the moisturizer around your eyes. My current eye cream is the Innisfree Orchid Eye Cream (30 ml). This is not my first time using the product and I bought it while I'm traveling to Seoul last year. The normal price is RM 104.50 in the Innisfree Store in Malaysia. The meticulously extracted active ingredient from Jeju orchids delivers exceptional sleekness to dry skin with its outstanding antioxidants. 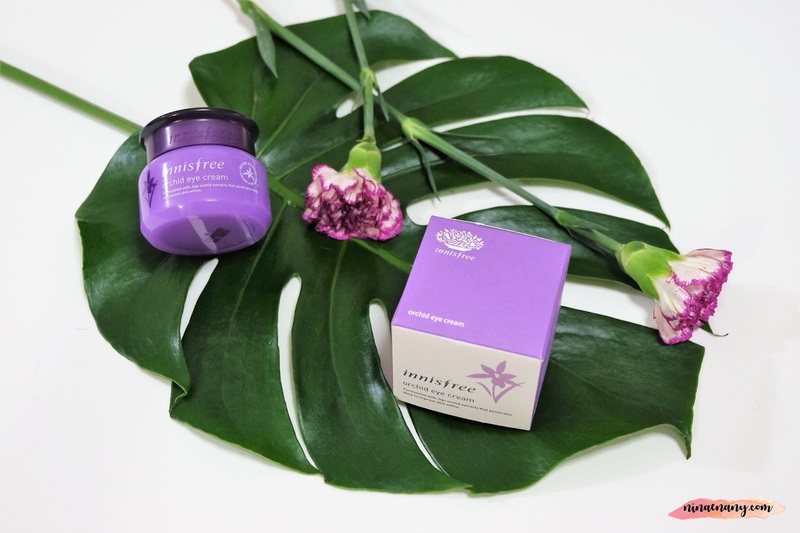 An anti-aging cream formulated with the vitality of Jeju orchids to tone and smooth the thin and sensitive eye areas. The Precious Orchid Elixir is a superior antioxidant ingredient extracted from Jeju orchids makes skin glowing and radiant while strengthening. The plentiful nutrition makes the skin texture healthier by reducing wrinkles, increasing elasticity, and improving the skin tone. The Innisfree Orchid Eye Cream has a thick cream formula with a floral scent but it does not feel sticky and I feel lightweight once I apply and patted around my eyes and lips area too. The tackiness disappears after some moments as well and leaves the skin with a more nourishing, firm, and elastic touch. I was using it on daily basis from morning and night for a few months. In my experience, the skin around my eyes and lips now feels much better than it did before. It's also this eye cream provides enough nourishment and moisture to the lines less visible. The skin is more elastic and also smooth after applying the cream. I can see my skin improved slowly and I also look younger rather than my actual age. The product is suitable for ladies around 25 until 40 years. I would like to give the 4 stars out of 5 stars to this product. I will repurchase this product again.